Peeled bananas are safe for most dogs to eat in moderation, and many veterinarians recommend the fruit as a healthy alternative to treats that are high in salt. While most dogs tolerate bananas just fine, allergic reactions occasionally occur. Bananas are packed with nutritional value, and they offer your dog many of the same benefits you enjoy when you eat this delicious fruit. For instance, bananas contain significant amounts of fiber, which relieves intestinal distress and balances the digestive system, so you can incorporate bananas into your dog’s diet whether he suffers from constipation or diarrhea. Bananas also are a great source of potassium and magnesium, two nutrients that help your pooch stay strong. Potassium builds and maintains muscle, and it helps regulate the acidity of your dog’s bodily fluids. Magnesium builds protein, fosters bone growth and helps your dog’s body absorb vitamins. Two letter vitamins—B6 and C—also are present in bananas, providing vital health benefits to your dog. Vitamin B6 keeps blood cells functioning properly so your pup receives plenty of oxygen to his brain and his muscles. Vitamin C, an antioxidant, strengthens cartilage and protects your dog’s cells. While there are lots of reasons why bananas are beneficial to your dog, keep in mind that you can give him too much of a good thing. Bananas have a high sugar content, which can cause constipation in your dog if you provide the fruit too regularly. Think of bananas as an occasional treat, rather than a diet staple or an entire meal. 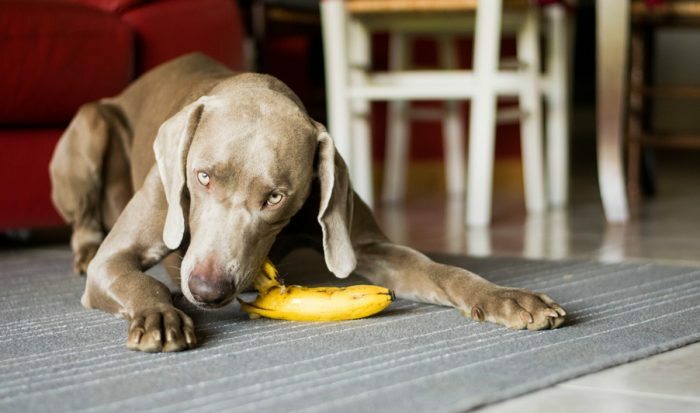 Peeled bananas are safe and nutritious for your dog, but banana peels aren’t. Although the peels aren’t toxic, they are difficult to digest, which may create a blockage. Either break off small amounts of banana to feed your dog, or make sure the peel is out of reach if you let your dog take bites from a whole banana. Some dogs dearly love bananas, but others don’t enjoy the strong smell, causing them to turn up their noses. If your dog doesn’t enjoy a simple room-temperature banana, he may respond more favorably when you try one of these alternative serving options. The easiest, most mess-free option is to freeze a banana, then peel and slice it before serving. Some dogs prefer this cold treat’s chewier texture over the softer feel of a room-temperature or extremely ripe banana. Another alternative is to mash a banana, and mix it with your dog’s regular food or some peanut butter. If you’re up for getting your hands a bit messy, here are some other serving alternatives that may pique the interest of dogs who enjoy chewing on frozen filled toys. One option is to puree bits of banana with peanut butter and a slice of cheese in a blender, and spread the mixture over a toy before freezing it. For a sweeter version, puree the banana with honey, yogurt and canned pumpkin, and apply it to the toy. Even if your dog enjoys bananas, his body may not tolerate this sweet fruit. The first few times you offer bananas to your dog, be on the lookout for gastrointestinal distress or an allergic reaction. Sudden weight changes that occur after eating bananas may indicate that your dog has a problem with this particular treat. Because different breeds of dogs have varying nutritional needs, consult with your veterinarian before introducing bananas into your pup’s diet. While bananas are good for your dog, they also make your life a little easier. When you’re packing provisions for a day out, skip the packaged snacks and simply share a few bites of banana with your best buddy for a treat that keeps you both healthy and happy.